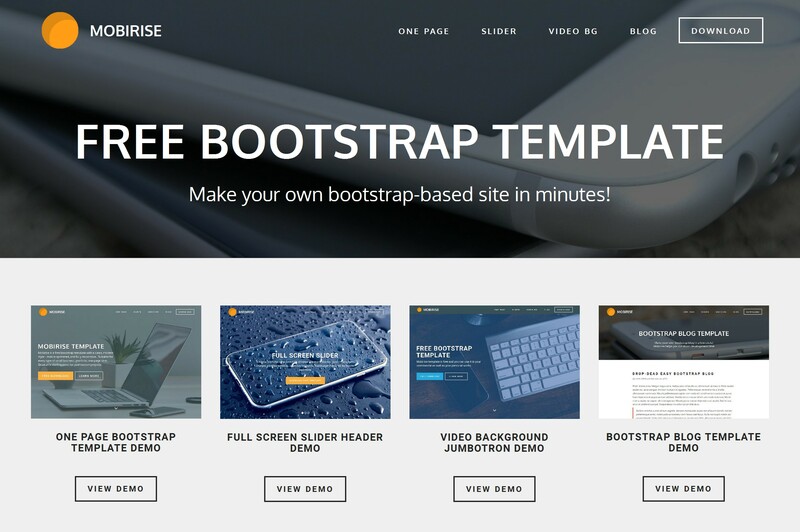 Eindhoven, Netherlands - December 14, 2015 – Netherland's based Mobirise has launched the free website template based on latest version of Bootstrap framework. Mobirise app helps the non-techies to create a mobile-optimized, great-looking website. The latest release comes with a free bootstrap theme with trendy, responsive layout that can be used for any type of website. The template, as well as the app, is free and can be used in any personal or commercial projects without any charge. The average website builder doesn’t have a degree in computer science, nor do they understand the intricacies of coding. Most are your average business owners who need to build the most effective website, but who don’t possess a lot of eduction to do so. Websites fall under two main categories today: your online website that is viewed on a computer or laptop, and the mobile website that is viewed on smart phone or tablet. Mobile websites are increasingly becoming popular today due to the number of users who are shunning the traditional computer, and instead using their smart phones or tablets for the bulk of their internet activities. Each type of website relies on specific tools to build it. Most people rely on website builder software. Software such as Mobirise makes creating a website from scratch fast and easy. The user simply chooses from one of the great templates, and plunks in their own photographs, copy, video and contact information. Mobirise stands out from the other mobile site builder software. It requires no coding at all, and best of all, it’s free to use for commercial or non-profit enterprises. Mobirise is available for both Windows and Mac users. For those who are curious, Mobirise uses the Bootstrap Builder Interface. This is a growing community that you may wish to learn more about. You can use Mobirise offline to create amazing mobile websites. With the rise of the solopreneur, the small business owner can benefit from selling products online, and presenting their services and promos in an online app. Mobirise is designed for the person who has not had any training in web development or web design. The tools are presented in a minimal and easy to understand format. The Mobirise interface is simple to use. It may also be of interest to the pro web designer or developer who is hoping to complete smaller client projects. Mobirise mobile website builder software keeps on top of the latest website trends, which makes it appear as if your website has too. No one will know that you’ve used this free web tool to create your mobile site. Instead of calling them pre-made templates, Mobirise utilizes “Blocks” that you choose from to create your mobile site. You can host your mobile website from any internet provider.